Are you going to send a campaign to your list? But before sending it, you need to remember some elements from top to bottom. 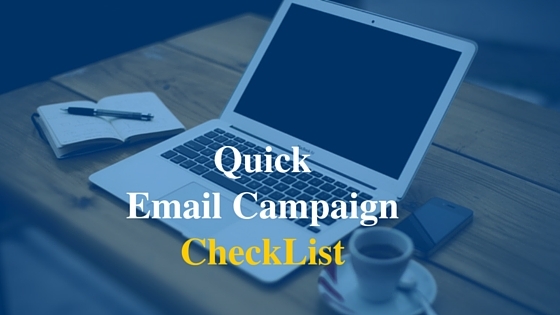 Here, we sharing a email checklist, Use this checklist to ensure everything is OK before hitting send. This checklist will help you to avoid the mistakes which can make you a Spammer! Before you send an email campaign, you need to ask for permission. In Subscriber mailing you can only send the mails for the subscribers that subscribed for the specific services, newsletters. To get the subscriber, you must place sign up forms on your relevant webpages and landing pages. Through the sign up process (Double opt-in recommended to build quality & strong email list) customer gives you the permission to send newsletters or campaign for specific service. There is low chances of your mail marked as “Report Spam”. Always follow the SPAM act based on the location (country) you are targeting to send the campaigns. You have to make sure that you have received permission to send emails to your list. 2. Put the “From Name and Email Address” ALWAYS!! You must mention From name (Company Name) and From address (Company’s corporate email ID). These details show who you are. When your recipients check the email, they look at the “from” field to see who sent the email. Make sure your “From email address” is valid and checked it on a regular basis. Your brand is easily recognizable by the from name and email address. 3. Place Your Company LOGO!! You must put your logo to header of campaign. It will make your campaign look more official and professional. With Logo, your recipients can easily recognize and remember your brand. Subject line is a soul of email which will decide open rate. Studies shows, approx 64% of people decide to open an email based solely on the subject line. So, you must thoughtfully write the subject of every email you send. Must Contain 50 characters or fewer. Subject line should convey a specific benefit to grab reader’s attention. Create “I want to open this now” type subject line. Why should your reader open this email now? Create a sense of urgency, if possible. Do not use the Spam keywords and phrases. Subject line should match with the content of your mailer. Want to make a good impression on your readers? Use the right words and expressions! You can include an opening greeting in your email – Make it personal. You can simply begin your email with “Dear Sir/Ma’am, “Hello John” or “Good Morning!”. Here you can insert dynamic tags to customize your email. 6. It’s All About CONTENT! Have you ever heard this EPIC phrase “CONTENT IS KING”, and it’s a universal truth! Keep the body text of your email concise; Never deceive or mislead. Content should be relevant, meaningful and interesting for your reader because they don’t have mush time to read it. So, put the important information first! Divide it in short paragraphs, subheadings, and bullet points. Don’t use a lot of images and visuals and make sure each image is relevant and correctly sized. Always use the ALT text for each image. Avoid using confusing, Spam words and phrases. 7. Did You Use Call-to-Action(CTA)? CTA is impossible to miss. It’s a way to invite recipient to take an action, for example, “Sign Up Now”, “Learn More”, “Download Now”, “Start Your Free Demo Now” etc. Consider creating a button you can use for your call to action instead of a plain text link. You must include a strong and clear call to action button in every email. Proper linking with your landing page. CTA will make it easier to click on mobile devices. Also Read: What is An Effective Call To Action (CTA)? You don’t want to irritate the customers or subscribers. Keep one rule in mind – Never share the information about a service for which they’ve never subscribed. Make a loyal relations with your subscribers and only send the information in which they’re interested. Never send Too MUCH messages because it will increase your unsubscribe rate. Social Sharing Icons to share your email on social platforms. “Forward to a Friend” link allows recipients to forward your campaign with your friends. You must include your address(current physical address) in your footer. Make sure your address is up to date. Place a Unsubscribe Link in every newsletter. if someone does not want to receive the mails for the services anymore, let them quit and make it easy for them. The View in Browser Link allows subscribers view a campaign in their web browsers. Email Signatures and Blog Link. You may gain the proper attention if you follow the genuine and smart segmentation practice. You must divide your subscribers list by various attributes such as interest, age, location, sign up date, previous activity, industry etc. It’s an important practice to send relevant message to right people and for improve the effectiveness of your campaign. Check your domain or IP reputation. IPs use sender reputation to decide whether (or not) they will deliver your email to your subscribers. keep your domain clear of any kind of blacklist and avoid Spam issues. Test your template design across multiple email clients before you start sending. Make sure images & other media look good in different devices. Send a preview to your own email address. Note: You can select a professional email marketing platform to create beautiful email campaigns. If you’ve done with above checklist, it is time to launch the campaign! GOOD LUCK!! Great tips for email marketing! This is a nice checklist for every new email marketer. I do agree with all your tips here, except number 5. You don’t really have to start your emails with a greeting. It does not make much of a difference – I have test this out. That is why I never say such greetings, because I have subscribers from all over the world. What I would do, instead, is use their Name a lot. That is why I ask for First Name when I capture leads. Now, if you are talking about making it more personal, using their First Name is the way to go! Anyways, overall, these are valuable tips for email marketing! Yeah, i am agree with you, greetings are not necessary all the time that’s why i mentioned (if possible) in point 5. I am glad to know that you like my overall post. Thanks for stopping by and sharing your views here.